The NSA 407MRH multi-role helicopter is based on Bell 407GX civil helicopter. Image courtesy of Ministry of Defense, France. The 48th Bell 407GX helicopter was delivered to NorthStar Aviation in November 2015. Photo courtesy of Textron. The NSA 407MRH helicopter features four-blade main rotor. Image courtesy of Alan Radecki via Wikipedia. The NSA 407MRH is equipped with a Garmin G1000H cockpit. Image courtesy of Waerfelu via Wikipedia. NSA 407MRH is a light multi-role helicopter developed by UAE-based technical aviation solutions provider NorthStar Aviation based on Bell 407GX civil helicopter airframe, built by Bell Helicopter. The new helicopter was unveiled during the International Defence Exhibition & Conference (IDEX) 2015 held in Abu Dhabi, UAE. The MRH variant is intended for use by government and military authorities in missions such as light attack, close-air support, intelligence, surveillance and reconnaissance (ISR) / airborne ISR (AISR), utility, cargo, and passenger transport. In 2011, NorthStar ordered a total of 56 Bell 407GX helicopters from Bell Helicopter, a subsidiary of Textron, for conversion into MRH version. 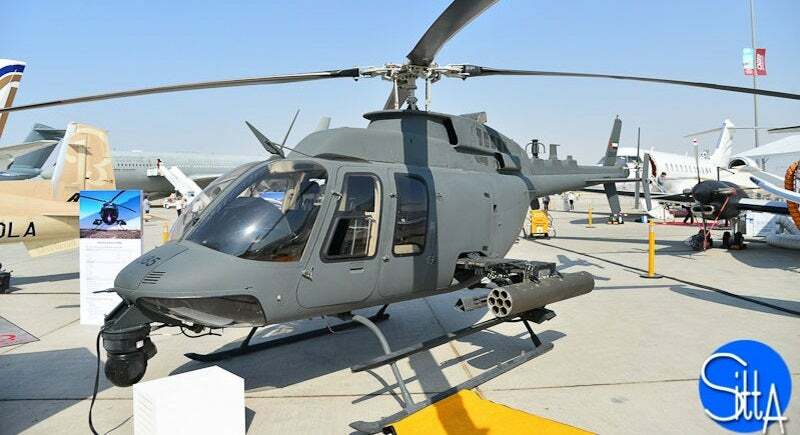 NorthStar took delivery of the 48th Bell 407GX at Dubai Air Show in November 2015. The unit cost of the NSA 407MRH is estimated to be $9m. The UAE Armed Forces ordered 30 retrofitted MRH helicopters, to be delivered through 2016. NorthStar signed an agreement with Control and Applications Emirates (CAE) to develop a training solution for the multi-role helicoptervariant in February 2015. The NSA 407MRH features lightweight, high-performance design and is equipped with all-composite, four-blade main rotor, two-blade teetering tail rotor, low skid-type landing gear, carbon fibre driveshaft cover, jettisonable outboard weapon pylon, and carbon fibre doors. The fuselage has a length of 10.17m, width of 1.5m and a height of 2.68m. The main and tail rotor diameters are 10.67m and 1.65m respectively. The maximum gross weight with external load is 2,722kg and 2,268kg with internal load. The rotorcraft is operated by a single pilot and its spacious cabin can be configured to meet different mission needs. The Garmin G1000H integrated flight deck provides the operator with navigation and positioning data, flight characteristics, as well as identification and communications information. Standard features of the night-vision, goggle-compatible cockpit include GDU 1040H primary flight display (PFD) and multi-function display (MFD), Garmin synthetic vision system, GIA 63H integrated avionics unit, GDC 74H air data computer (ADC), radar altimeter, GTX 33H Mode S transponder, GMU 44 magnetometer, dual GPS system and VHF ATC radios. The mission management system consists of enhanced instrument panel, moving map, multiple split-screen views and integrated HD video recording unit. Navigation and communications systems aboard the NSA 407MRH include three integrated antenna mounts, white / infrared (IR) strobe light, white/IR dual mode searchlight, IR position/formation lights, GPS antennas, UHF SATCOM provision, ARC-210 VHF/UHF antennae, UHF SATCOM provision, Tetra radio, tactical multi-band radios, and Tacan. "The new helicopter was unveiled during the International Defence Exhibition & Conference (IDEX) 2015 held in Abu Dhabi, UAE." A FLIR Star SAFIRE 260-HLD EO/IR (electro-optical / infrared) gyrostabilised sensor beneath the nose provides high-resolution imagery, target tracking and identification both day and night during ISR / AISR missions. The advanced lightweight weapons integration platform (ALWiP) allows for mounting of a variety of weapons on removable outboard weapon stores in up to four locations, two on each side. The weaponry include AGM 114 Hellfire air-to-surface missiles, M134 7.62mm mini gun, GAU-19 0.50 calibre machine gun and Hydra 70 rockets, which are carried in a seven-shot rocket pod. The M134 gun and Hellfire missiles are used for light attack missions, while the close-air support operations are supported by Hydra 70 rocket, GAU-19 and M134 guns. The helicopter features two ammunition supply units, each with 500-round can of 0.50 calibre or 3,000-round can of 7.62mm. A weapons management unit, consisting of fire control unit, stores management unit and gun interface unit, facilitates management and control of weapons. The Rolls-Royce M250 turboshaft engine offers fuel efficiency and high-performance in hot and high conditions. The standard and auxiliary fuel capacities are approximately 483l and 72l, respectively. The base version has a maximum cruise speed of 246km/h and a never-exceed speed of 260km/h, and can operate over a range of up to 620km. Its maximum flight time is four hours and the service ceiling is 5,733m.